Recently, a friend came through Nashville for a brief reunion. 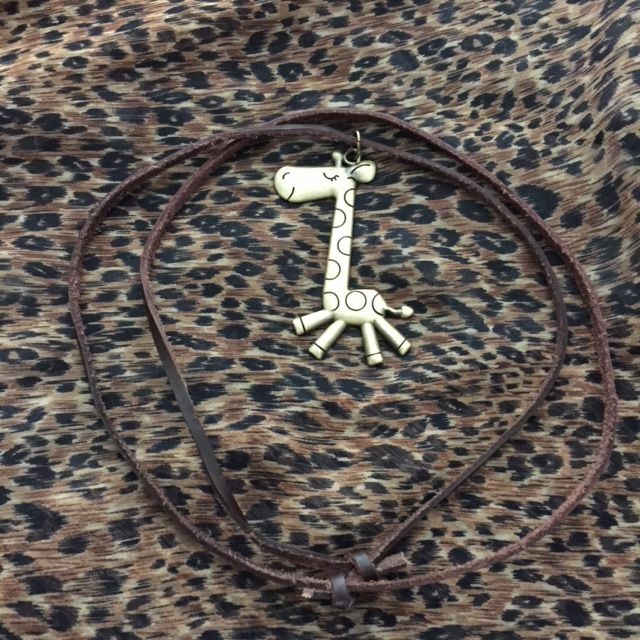 Since he knew my favorite animal is the giraffe he surprised me with a neck décor of a brass giraffe. I was so excited! I loved the smile the little giraffe had on his face and the playful appearance of his body design. This gift and the expression on the little animal’s face brought back memories of the time I discovered that a giraffe was my favorite animal… and, how that particular animal was so representative of my philosophy about life and living. The story begins like this…The company I was working with at the time was preparing for a downsizing of their workforce. As part of the downsizing package the organization sent each affected employee to a 5-day outplacement process with the goal of preparing them for a successful career transition. The facilitator of the workshop stated that the key goal of the five days was to assist each client in making their career transition purpose and passion focused. He suggested that it would include a lot of personal self-awareness exploring. One of the exploring activities we were asked to complete was to take a few minutes and think about our favorite animal… then define the reasons why that was our favorite animal. Well, for some time I sat there staring at the paper and the pen in my hand and finally zoned out on the white wall in front of me. After a period of time with nothing coming forth, I decided to glance at the other participants who seemed to be nearly done with the exercise. I felt like they were so cool and would definitely get another position right away. But what about me, since I had no idea of my favorite animal? Would that make it more difficult? I felt absolutely ignorant that I could not come up with a single animal that held significance for me. Just about the moment the facilitator said “time is up” on the activity, a spark of knowing or a fear of not knowing, fell upon me like a ton on bricks. Quickly, my pen fell to the paper and with a few strokes the outline of an animal began to take form. The sketch that emerged was the rough draft of a giraffe in a very ‘un-artistic’ graphic image. I was so excited! I, at last, had a favorite animal. But then, after the pressure was off, I asked myself, “what was so special about finding one’s favorite animal?” And why the giraffe for me? As the various parts of the animal came into visible sight on my piece of paper, I was so amazed. I began to see that what I admired about the giraffe was really the very essence of who I desired to be… and believed, for most part, it definitely defined my personal life philosophy. Let me explain to you as I did to the group that very day. First, I shared with the group, my struggle of even having a snippet of understanding of who my favorite animal was. Then as if it was a story I had told many times previously, the words flowed freely as I shared to all. “My favorite animal is the giraffe”, I said. And the reason the giraffe is so significant to me is that it has a long neck to rise above the muck and ’ain’t it awful’ of life; and see a vision of possibility beyond its present circumstance. I, also, shared that I liked the fact that it has such long eyelashes and stands so erect; as if it feels beautiful and is proud of being a giraffe. I was so empowered after that activity. It had given me a solid glance of who I truly was as a woman facing a life moment of uncertainty. As, I later contemplated the value of the activity, I realized that life transitions are easier when we can rise above the situation as it presently seems and see a vision of possibility. In those moments it is also, very important that we feel good about who we are and what we have to offer. That moment in time has had a significant impact of much of my future life as a business owner, author, speaker and coach. The learnings from the giraffe has been the key to keeping it real in the ups and downs of my life and living. My speaking and client coaching is always focused on the ‘teachings of the giraffe’! . For example: My first book ‘Wearing High Heel in a flip flop World’ is simply a metaphor for getting out of one’s flip-flop life thinking and stepping into a higher level of possibility thinking. And, in my next book the ‘NOW, HOW and WOW of Success” the NOW represents the present situation/view and the WOW is the vision/goal desired. Yes, I owe the giraffe a lot in my personal living, as well as, in my coaching process. May the teachings of the giraffe keep you on your Runway to Success during the ‘ups and downs’ of your living. A side note: I did not lose my job after that 5-day workshop but, became the company’s outplacement consultant during the downsizing process. AND… I have a bedroom in my home devoted to giraffe memorabilia and African art pieces. It serves as a place to go for a reminder… wherever I am in my life or whatever is happening, to stay above the muck and look for the possibilities!!! Life is a gift, the way you wrap it is your choice.